If you are looking for information on the Bumper Doc franchise business opportunity, Bumper Doc franchises or Bumper Doc franchising, then you have come to the right place. We are excited to offer you an innovative concept with excellent potential for income and growth. The Auto Reconditioning market is growing tremendously by offering efficient, quality services that are in high demand by today's vehicle owners. Auto reconditioning is estimated to generate $10+ Billion a year, and it is expected to continue growing in the coming years. 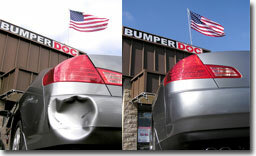 Your BumperDoc Franchise will offer same-day bumper repair, 2-3 day minor auto body repair, paintless dent repair, auto detailing, interior repair, windshield repair, and more. These services save time and money for customers while delivering the high quality results they demand. BumperDoc's multiple revenue centers also give you many opportunities to advertise and up-sell additional services. With more than 230 million vehicles on the road and a shortage of retail auto reconditioning providers, BumperDoc is positioned to fill a critical need in an enormous market. In fact, BumperDoc's affiliate-owned Center in San Diego, California has seen monthly gross revenue increase more than 100% from 2005 to 2007: from a monthly average of $60,000 in 2005 to an average of over $125,000 per month 2007. Take Advantage of the Power of the Internet. In addition to print, radio, and video materials, BumperDoc will provide you with cutting edge Internet support. The importance of Internet marketing cannot be overstated, and your franchise will benefit from custom-built websites and our network of existing sites. A strong Internet presence can make a critical difference to your business in the years ahead. Looking for an Opportunity with Increasing Demand? In the last five years, the percentage of customers who pay for a minor repair without filing an insurance claim increased 75% - from 12% to 21%. And one out of eight Americans had minor damage repaired in the last year alone. As insurance deductibles rise and customers are increasingly motivated to avoid filing an insurance claim for fear of raised premiums, BumperDoc's quality services give consumers just what the doctor ordered. And for customers who do wish to file an insurance claim, BumperDoc is there to help. We are on State Farm's™ Paintless Dent Repair Preferred Provider list, and insurance companies are increasingly looking at auto reconditioning to reduce their claims and provide the best value to their clients. There will always be a need for collision repair centers, but times have changed. 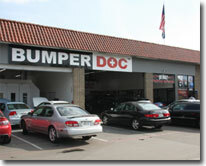 The simple fact is that BumperDoc is better suited to repair minor vehicle damage. With the addition of outstanding customer service and a clean, attractive facility, your customers will return repeatedly and tell their friends and family about your business. Benefit From a "Green" Business Model. Our innovative practices allow us to repair many damaged parts that would be replaced and discarded into a landfill by most collision repair shops. This saves natural resources, along with time and money, and provides you with a powerful marketing tool. Studies show that the majority of Americans choose to support environmentally responsible businesses, a trend expected to continue with your future customers. BumperDoc is positioned to be the leader in this exciting new market, and we are looking for the most important ingredient: the right people. When selecting franchisees to represent BumperDoc, our emphasis is on character and integrity. We are looking for someone who enjoys working with customers and managing employees, and who understands the importance of teamwork. Industry knowledge is important, but it can be learned with our support. A positive customer experience is determined almost exclusively by the quality of customer service received, and we know that a franchisee with strong character and integrity is most capable of achieving this critical goal. If you share our values and you are looking for an innovative business model with excellent potential for income and growth, apply for your franchise today!